Calçotada: An organic and traditional calçotada. A calçotada is the most traditional way of eating calçots and it has become an annual gastronomical celebration held between January and April. Calçots are sprouts of a specific variety of onions grown in the Valls area in Tarragona’s province. 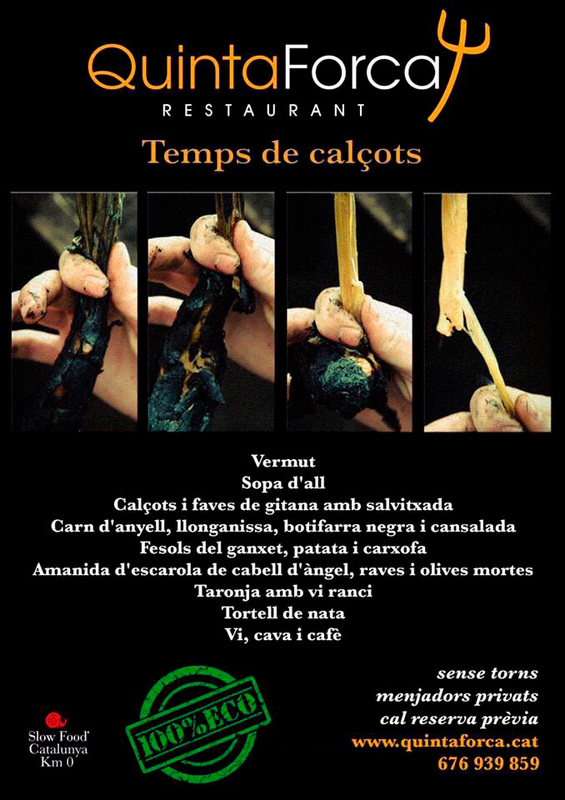 “QuintaForca’s calçotada is a great meal. Calçots are grilled until charred, wrapped in paper to steam, then consumed by peeling off the charred skin and dipping the white portion in salvitxada, a typical sauce. Salvitxada is made using the finest almonds, hazelnuts and a special locally grown pepper variety called “pebrots nanos”. Broad beans cooked in a traditional style. Lamb and local sausages roasted in the coals of the fireplace. Fesols del ganxet, a local variety of beans fried. To end up, wine, orange and cream cake”.